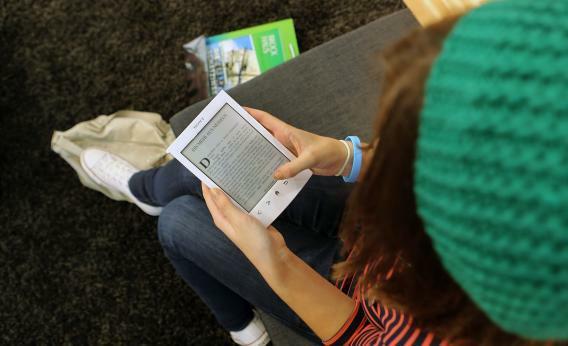 CourseSmart: E-readers in the classroom tattle on students who don't read them. Today’s New York Times offers an upbeat take on a technology that is sure to strike panic into the guts of students everywhere: e-textbooks that tattle on you if you don’t read them. “It’s Big Brother, sort of, but with a good intent,” the dean of Texas A&M’s business school, Tracy Hurley, cheerily told the Times. But Hurley clearly doesn’t find it eerie. “If CourseSmart offers to hook it up to every class, we wouldn’t decline,” she said. So here’s a question: Did Hurley actually read 1984? What it wouldn’t tell me is whether—pardon the Oldspeak—she’d actually read the book. She could have just flipped from page to page once every two minutes while playing a video game or talking on the phone. Perhaps CourseSmart could correct for that by adding eyeball-tracking technology. But it still wouldn’t be able to tell me whether Hurley had absorbed 1984’s messages or thought critically about its themes and how they might apply to our world today. No, the only way I could learn that is by actually talking to her, quizzing her, assigning her an essay—or, perhaps, seeing her quoted in the Times. And then I could respond, not by awarding or docking her points based on her “engagement index,” but by asking her a substantive question: Isn’t it possible that Big Brother started out “with a good intent” as well?